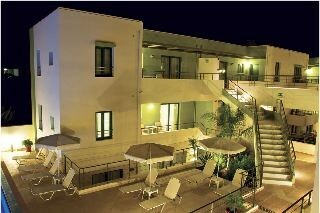 This hotel enjoys a great setting, in Agioi Apostoloi. The hotel is situated in close proximity to a host of local attractions. Within a short distance, guests can enjoy the host of shopping opportunities, dining options and entertainment venues in the vicinity. The hotel presents an attractive architectural style. Guests will be instantly impressed by the warm hospitality and professional service they receive at this hotel. The guest rooms are tastefully decorated, featuring refreshing fabrics and modern furnishings. The guest rooms contain modern amenities, catering to the needs of each individual guest. Ideal for families, friends or couples, this hotel is the only choice. NO Large pets allowed (over 5 kg), YES Wheelchair-accessible, YES Car park, NO Small pets allowed (under 5 kg), NO Garage. City centre - 3000m, Harbour - 3000m, Beach - 300m.